I am a lousy PA parent. I watch in awe as my peers chair meetings, organize bake sales, get street permits for carnivals, and write grants for enrichment programs, all the while juggling jobs and multiple children and various and sundry overwhelming challenges and responsibilities. I honestly don’t know how they do it. Although I manage to attend some meetings and sell my appropriate quota of raffle tickets, I am fully aware of my shortcomings in this area. And as education budgets continue to get cut, this kind of grassroots organizing is becoming more important than ever. I love the idea of supporting my school—I’m simply not very good at much of the above. Luckily, I have an excellent role model in my house who has been compensating for his weaknesses and leveraging his strengths for as long as I can remember: Brooks. Taking a page from his play book, I try to contribute in less traditional ways. What I am good at is building websites, so my husband and I started ShopForCharityNow.com back in 2007 which raises money for charities, including schools. To date, the site has raised over $3,000 for quite a wide range of good causes, including the Red Cross, Autism Speaks, The Michael J. Fox Foundation, and, last but not least, InsideSchools.org! Gillen Brewer is now on our list, and most recently, Learning Spring. If you’d like to add your school, simply send us an email. The “gotcha” is that we generally raise money in pretty small amounts. 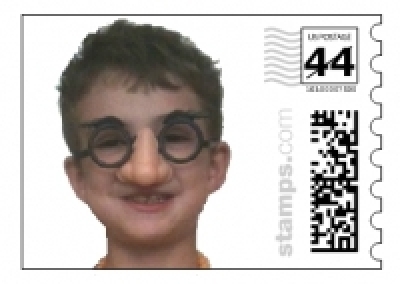 But this year, there is an especially appealing promotion: if you purchase a single $20 sheet of PhotoStamps (real postage with a personal photo), your charity gets $15! “Groucho Brooks,” pictured above, will grace our holiday cards this year, and I was able to effortlessly help out my school. Please join me and do the same for your school! Author’s Note: My husband and I now donate 100% of the funds that come in to ShopForCharityNow.com. If you’d like to support a charity or shop at a store that we don’t list, please check out GoodShop.com or IGive.com—these kinds of philanthropic websites won’t cost you any extra money, and are a great way to trigger automatic donations with purchases you were already going to make.